Qualifying Final in 60 seconds Watch highlights from Collingwood's 56 point victory over Williamstown in the 2nd Qualifying Final. 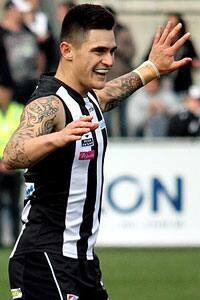 Marley Williams kicked two goals in the VFL Magpies' 46-point win over Williamstown. Photo: Shane Barrie. Bruised and battered, but with big smiles. The Collingwood VFL has advanced to the Preliminary Final after a dominant 46-point win over Williamstown at IKON Park. The neutral venue was kind to the Magpies as the stands filled with Black and White watched a strong four-quarter performance filled with encouraging signs. The VFL Pies had eight goals and a 35-point lead at half time, before the strong showing continued in the second half. Jarrod Witts continued his hot streak with a fantastic game against Williamstown’s Nick Meese, while Brent Macaffer, Ryan Pendlebury, Matthew Smith and Jordan Kelly were all recognised for strong performances. The Seagulls had brief periods of control throughout the game, however inaccurate goalkicking and impeccable Collingwood pressure kept them from posing a true threat. “From the first minute to the last, it was just a really good team effort,” captain Jack Hellier told Collingwood Media post-game. The coach agreed with his captain’s sentiments. “It was a fantastic team performance and to win and play the way,” Dale Tapping said. However the win came at a cost. Jack Frost limped to the rooms at half-time on crutches after suffering what appeared to be a severe ankle injury on the wing in the second term. In the third term he was joined on the bench by VFL leaders Hellier and Ben Moloney. Hellier was the first to go, as he reached for his shoulder after copping heavy contact in Williamstown’s forward pocket. Just minutes later Moloney was the next to go. The vice-captain lay on the ground in the centre square and couldn’t bear weight on his leg as he left the ground. Tapping couldn't confirm the severity of the injuries post-game. "They’ll get scanned and we’ll go from there… We’re hopeful they’re not as bad as they seem," he said. With a win looking probable for most of the day, the Magpies win and resulting week off is timely. “The break will come at a good time for us,” Tapping commented. Hellier added that “it couldn’t have come at a better time”. “We had a few blokes who were a bit sore, so I’m sure we’re going to be lapping it up and recovering well for this week off,” he said. In addition to recovery, there will no doubt be eyes tuned to a do-or-die Semi Final between Footscray and Essendon. The pair will face off next Saturday for a chance to meet Collingwood in the penultimate game of the 2016 VFL season. Regardless of the opposition, the VFL Magpies will no doubt take confidence from what was the biggest finals win since 2009.